Warriors do not always wear armor. Sometimes they wear three-piece suits or denim. 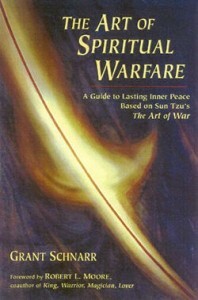 Nowadays, thousands of people search Sun Tzu's ancient war manual for business strategies. Grant Schnarr goes deeper, finding in the old general's savvy a wealth of wisdom about how to defeat our one true enemy---our own negativity. Here are brilliant tactics for enlisting our higher powers and outwitting our tendency toward self-destruction. Whether you fight addiction, depression, a debilitating fear, or a quick temper, Grant's penetrating insights impart courage. His unflinching honesty, often funny stories, and practical exercises can help anyone make peace at home, at work, and in the private depths of being. "Grant Schnarr's words pour forth with an eloquence born of integrity. Here is truly a spiritual autobiography, written with the passion and experience of a man who knows the terrain of the spiritual battlefront, understands the tactics of the enemy, and wages Holy War-- that is, a war of love. He is an inspiring friend to all, rousing us to join the battle and share in the victory. And in the end, when the smoke and dust have cleared, we discover that, in a miraculous way, our lives have shifted from being self-centered to being spirit-centered." -- Ray Silverman, Ph.D., editor, Helen Keller's Light in My Darkness Grant Schnarr, a Swedenborgian minister, is author of several books on spiritual recovery. He leads Spiritual Warfare Effectiveness Training groups for men and women.